Andre Machado, MD, PhD, and Ken Baker, PhD, are co-primary investigators on the grant, which will operate in parallel with their on-going, first-of-its-kind clinical trial exploring the use of DBS to restore motor function in patients who have suffered a stroke. The new award will support continued efforts in pre-clinical models to refine the efficacy and better understand the mechanisms of DBS in restoring motor function in post-stroke recovery. 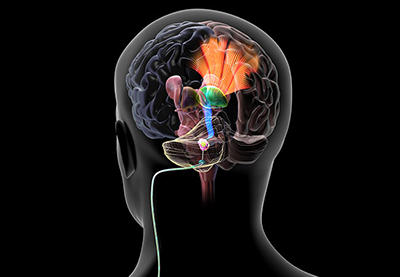 The researchers hope to learn how the type of stroke influences the benefits of DBS treatment. A better understanding of these dynamics may help identify biomarkers that indicate which patients are good candidates for DBS and may most benefit from the therapy. They are also interested to learn how the timing of treatment onset and age may influence patient outcomes. "If this research succeeds, it offers new hope for patients who have suffered a stroke and have remained paralyzed. It is an opportunity to allow our patients to rehabilitate and gain function and therefore gain independence," said Dr. Machado, Chair of the Cleveland Clinic Neurological Institute.